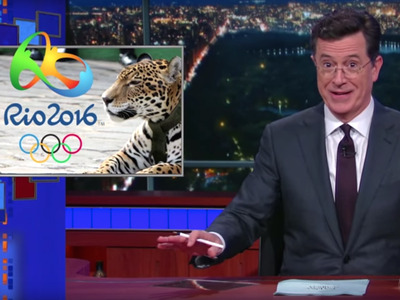 Stephen Colbert pointed out some major red flags ahead of the Summer Olympics in Rio. From construction problems, corruption, and violent crime to the looming threats of contagious disease, the games are in disarray. The construction has been plagued by criminal price fixing and kickbacks, which has led to several top executives being charged or imprisoned. “Though on the plus side for those executives, the prisons won’t be completed until 2036,” Colbert joked. Also on Tuesday, first responders staged a protest over deep budget cuts. Then there’s the health crisis. Fear of catching the Zika virus has already led several athletes to pull out of the games. Others fear the virus’ effect on their ability to have children. Some male athletes are even freezing their sperm. Then there’s the pollution and deadly bacteria that have been found in the bays intended for the Olympic boat races. “Boy, I would hate to work for a network that paid billions of dollars to broadcast that cluster-munch,” the CBS late-night host said, referring to Olympics broadcaster NBC.